Reduced risk of Caesarean birth † *. Reduced risk of instrumental birth † *. Reduced need for painkillers or epidural during birth † *. Reduced rate of induction of labour † *. Increased likelihood of initiating breastfeeding *. Increased likelihood of successfully establishing breastfeeding & breastfeeding at 6 weeks *. Lower incidence of depressive symptomatology †. † Hodnett ED, Gates S, Hofmeyr G, Sakala C. Continuous support for women during childbirth. Cochrane Database of Systematic Reviews 2013, Issue 7. Art. No. : CD003766. DOI: 10.1002/14651858.CD003766.pub5 and Bohren MA, Hofmeyr GJ, Sakala C, Fukuzawa RK, Cuthbert A. Continuous support for women during childbirth. Cochrane Database of Systematic Reviews 2017, Issue 7. Art. No. : CD003766. DOI: 10.1002/14651858.CD003766.pub6. 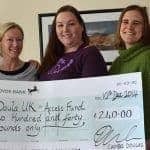 This is a selection of the research papers published on doula support. Hodnett, ED., Gates, S., Hofmeyr, GJ. & Sakala, C. Continuous support for women during childbirth Cochrane Database of Systematic Reviews 2007, Issue 3. Download paper (PDF) here. Keenan, P. Benefits of massage therapy and use of a doula during labor and childbirth Alternative Therapies in Health & Medicine Jan 2000, 6(1), pp.66-74. Abstract available here. Rosen, P. Supporting women in labor: analysis of different types of caregivers Journal of Midwifery & Women’s Health Jan-Feb 2004, Vol 49(1), pp.24-31. Abstract available here. Harris SJ1, Janssen PA, Saxell L, Carty EA, MacRae GS, Petersen KL. CMAJ. Effect of a collaborative interdisciplinary maternity care program on perinatal outcomes. 2012 Nov 20;184(17):1885-92. doi: 10.1503/cmaj.111753. Epub 2012 Sep 10. Abstract available here. Kozhimannil KB1, Attanasio LB, Jou J, Joarnt LK, Johnson PJ, Gjerdingen DK. Potential benefits of increased access to doula support during childbirth. The American Journal of Managed Care. 2014 Aug 1;20(8):e340-52.Abstract available here. Ballen, LE. & Fulcher, AJ. Nurses and doulas. Complementary roles to provide optimal maternity care Journal of Obstetric, Gynecologic, and Neonatal Nursing 2006, 35, pp.304–311 Abstract available here. Campbell, D., Scott, KD., Klaus, MH. & Falk, M. Female Relatives or Friends Trained as Labor Doulas: Outcomes at 6 to 8 Weeks Postpartum. Birth Sept 2007, Vol 34(3), pp.220–227. Abstract available here. Campbell, DA., Lake, MF., Falk, M. & Backstrand, JR. A randomized control trial of continuous support in labor by a lay doula Journal of Obstetric, Gynecologic & Neonatal Nursing 2006, 35, pp.456–464. Abstract available here. Khreisheh, R. Support in the first stage of labour from a female relative: the first step in improving the quality of maternity services Midwifery 2009 (Article in Press). Abstract available here. Martin, T., Stein, JH., Kennell, JH. & Fulcher, A. Benefits of a Doula Present at the Birth of a Child Pediatrics 2004, 114(5), pp.1488-1491. Download paper (PDF) here. McGrath, SK. & Kennel, JH. A Randomized Controlled Trial of Continuous Labor Support for Middle-Class Couples: Effect on Cesarean Delivery Rates Birth 2008, 35(2), pp.92-97. Abstract available here. Trueba, G., Contreras, C., Velazco, MT., Lara, EG. & Martínez, HB. Alternative Strategy to Decrease Cesarean Section: Support by Doulas During Labor Journal of Perinatal Education Spring 2000, 9(2), pp.8-13. Abstract available here. Gjerdingen DK1, McGovern P, Pratt R, Johnson L, Crow S. Postpartum doula and peer telephone support for postpartum depression: a pilot randomized controlled trial. J Prim Care Community Health. 2013 Jan;4(1):36-43. doi: 10.1177/2150131912451598. Epub 2012 Jun 20. Abstract available here. McComish, JF. & Visger, JM. Domains of Postpartum Doula Care and Maternal Responsiveness and Competence Journal of Obstetric, Gynaecologic & Neonatal Nursing Mar/Apr 2009, Vol 38(2), pp.148-156. Abstract available here. Goldbort, J. Postpartum depression: Bridging the gap between medicalized birth and social supportInternational Journal of Childbirth Education December 2002. Abstract available here. Edwards RC1, Thullen MJ, Korfmacher J, Lantos JD, Henson LG, Hans SL. Breastfeeding and complementary food: randomized trial of community doula home visiting. Pediatrics. 2013 Nov;132 Suppl 2:S160-6. doi: 10.1542/peds.2013-1021P. Abstract available here. Kozhimannil KB1, Attanasio LB, Hardeman RR, O’Brien M. Doula care supports near-universal breastfeeding initiation among diverse, low-income women. J Midwifery Womens Health. 2013 Jul-Aug;58(4):378-82. doi: 10.1111/jmwh.12065. Epub 2013 Jul 9. Abstract available here. Mottl-Santiago, J., Walker, C., Ewan, J., Vragovic, O., Winder, S. & Stubblefield, P. A hospital-based doula program and childbirth outcomes in an urban, multicultural setting Maternal and Child Health Journal May 2008, Vol 12(3), pp.372-377. Abstract available here. Hofmeyr, GJ., Nikodem, VC., Wolman, W., Chalmers, BE. & Kramer, T. Companionship to modify the clinical birth environment: Effects on progress and perceptions of labour and breastfeeding British Journal of Obstetrics & Gynaecology Aug 1991, 98, pp.756–764. Abstract available here. Kennell, JH., Klaus, MH., McGrath, S., Robertson, S. & Hinkley, C. Continuous emotional support during labor in a US hospital: A randomized controlled trial. Journal of the American Medical Association May 1991, 265(17), pp.2197-201. Abstract available here. Klaus, MH. & Kennell, JH. The doula: an essential ingredient of childbirth rediscovered. Acta Paediatrica 1997, 86(10), pp.1034–1036. Abstract available here. Klaus MH, Kennell JH, Robertson SS, Sosa R. Effects of social support during parturition on maternal and infant morbidity British Medical Journal 1986; 293:585–587. Abstract available here. Langer, A., Campero, L., Garcia, C. & Reynoso, S. Effects of psychosocial support during labour and childbirth on breastfeeding, medical interventions, and mothers’ wellbeing in a Mexican public hospital: a randomised clinical trial British Journal of Obstetrics & Gynaecology Oct 1998, 105(10), pp.1056-63. Abstract available here. Madi, BC., Sandall, J., Bennett, R. & MacLeod, C. Effects of female relative support in labour: a randomised controlled trial Birth 1999; 26(1), 4-8. Abstract available here. Scott, KD., Klaus, PH., & Klaus, MH. The obstetrical and postpartum benefits of continuous support during childbirth Journal of Women’s Health Gender Based Medicine Dec 1999, 8(10), pp.1257-64. Abstract availablehere. Wolman, WL., Chambers, B., Hofmeyr, GJ. & Nikodem, V. Post-partum depression and companionship in the clinical birth environment: A randomized, controlled study American Journal of Obstetrics & Gynaecology 1993, 168, pp.1380–1393. Abstract available here.